MINNEAPOLIS (April 23, 2015) – A 2015 study conducted by VITAL WorkLife and Cejka Search, reveals physician stress and burnout is on rise since their benchmark study in 2011, published under former company name Physician Wellness Services. 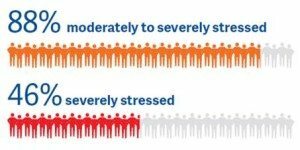 Forty-six percent of physicians say they are severely stressed today, compared to 38 percent in 2011. Overall, 89.2 percent of survey respondents desired some degree of job change, ranging from switching to a new job or practice to retiring early or leaving the practice of medicine entirely. Physicians experience stress from their personal lives, work lives and external factors. Leading causes of stress are maintaining a healthy work/life balance, complying with the health care reform and keeping up with the demands of administrative tasks. Increased stress has a negative effect on physicians’ work and personal lives. The top work-life effects include lower job satisfaction, a desire to work fewer hours, retire early and leave the medicine practice entirely. The top personal-life effects include general feelings of tiredness, irritability, moodiness, apathy or cynicism. An overload of stress can ultimately lead to physician burnout. “The higher the prevalence of stress and burnout, the higher the risk for organizations and patients,” Best said, citing loss of revenue and reduced care/patient safety due to physicians’ lack of sleep, issues with communication and difficulty making decisions. Physicians indicated their top three preferences for managing stress are more time off, more ancillary support and a better understanding from administration of the challenges they face. Currently about half of health care organizations provide wellness initiatives to assist physicians with managing stress. Unfortunately, physicians reported it is difficult to find time to use them. To download a free copy of the complete study and more information on how health care organizations can help their physicians, visit http://info.VITALWorkLife.com/Stress2015. We help organizations, teams and individuals to be their best. VITAL WorkLife, Inc. is a national behavioral health consulting practice supporting all dimensions of well being in the workplace. For over 35 years, our proven solutions have helped to reduce workplace conflict, facilitate culture change, strengthen interpersonal communication and build well being.